Happy Joyful July to you! and Mother Nature is having hot flashes! This past week I had the joyful opportunity to create a banner of prayer flags! each flag represented a prayer or wish I hold for myself, my family and the world. I even tried my hand at a bit of embroidery! I love that she can come out of the pocket. Hanging prayer flags outside, lets the breeze carry the healing prayers all around the world. 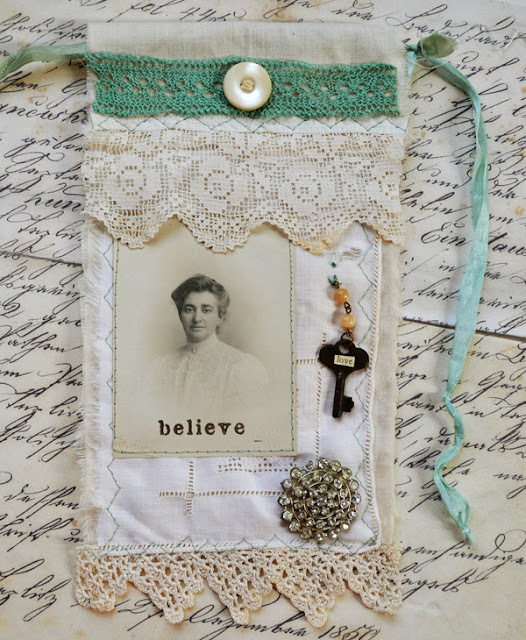 I received an invitation to join a Prayer Flag swap with Lenna at Creative Lenna! She hosted a mini book swap a year ago that I loved and I am excited to join in this swap too. My hands are already reaching for more material to get started on! 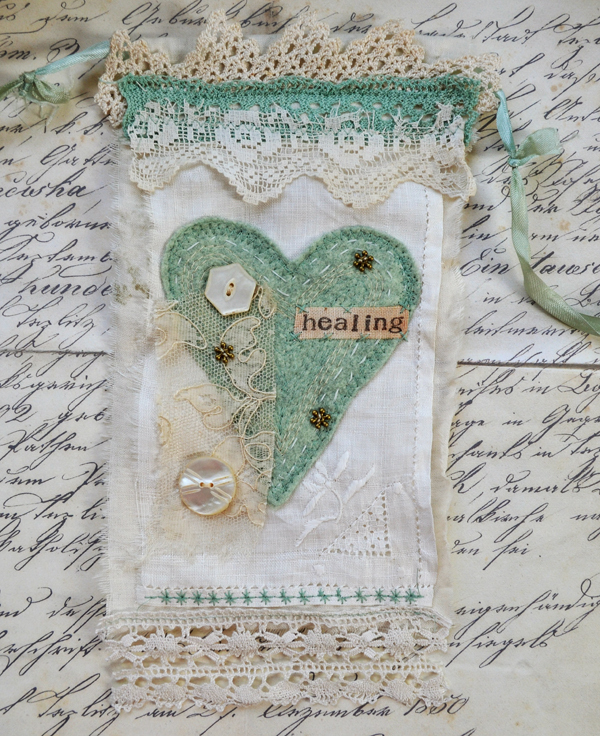 I have seen these beautiful prayer flags on blogs all over the Internet lately...and I am thrilled to have had the opportunity to put my prayers in form. 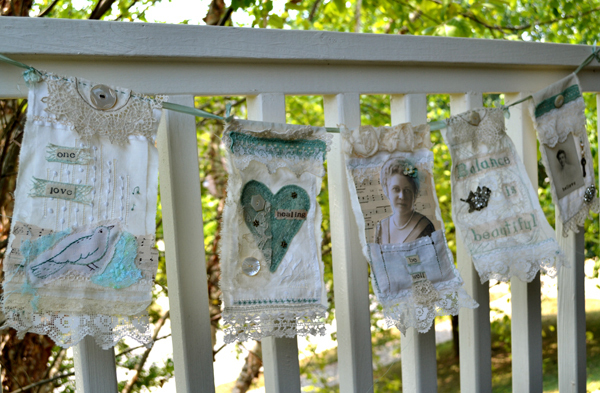 I was so delighted to see the prayer flags Frieda Oxenham created and is showing on her blog. They are amazing! Don't miss my JOYFUL JULY GIVEAWAY! click here to comment to enter! I love this idea - I'm off to check it out. Your banner is beautiful, and so inspiring! Love it! These prayer flags are absolutely beautiful. I feel healing coming just by looking at them. They are so special. I would love to make some also when I get a little more free time. In fact, I can't wait! I love the idea of prayer flags - I remember seeing some Tibetan ones fluttering in the breeze on a chalet in the Swiss mountains - it was a lovely sight. 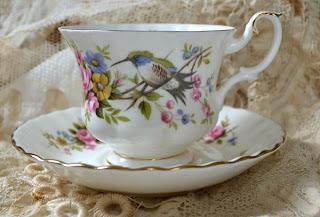 Yours are so beautiful, many vintage treasures. Off to look at some of those links now. Wow, Terri, these are gorgeous! I'm already crossing my fingers for Lenna's swap!! And thanks so much for mentioning my blog! So sweet of you. WOW... 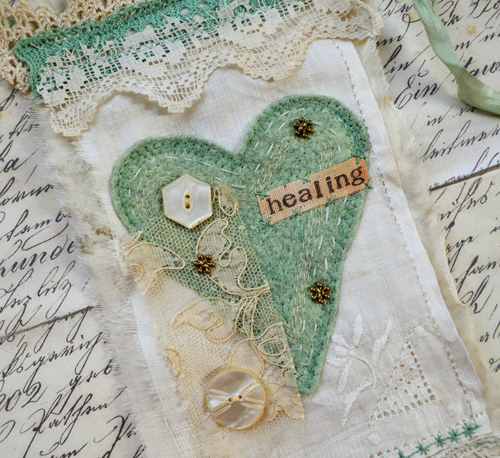 I love the idea of making prayer flags. I will also check out the links you provided. Your little embroidered bird is so adorable and the word healing say more than a thousand words of comfort and compassion. Terri, what beautiful prayer flags you made following Gail's tutorial! I visited her site, signed up, and have found the workshop. How apropos! 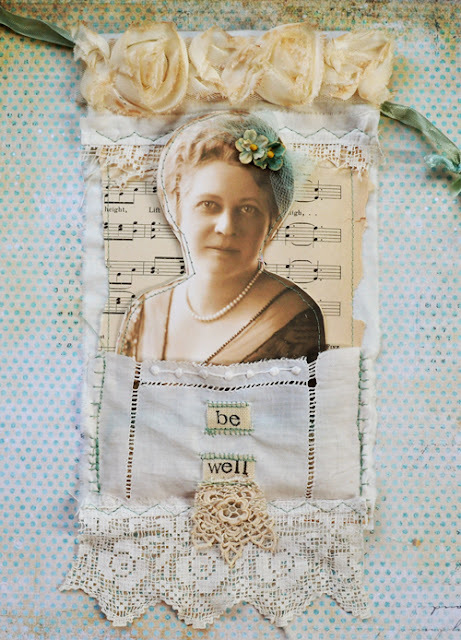 I'm going to be making more flags for the swap myself -- so thank you for this great inspiration. I am so glad you joined my prayer flag swap!! Can't wait to see what you create. Terri, I've seen the prayer flags on blogs also. I love the idea and I must say your are just stunning. Each flag is beautiful by it's self but together they are stunning! Mother Nature having hot flashes - how true!! I do feel sorry for her. Beautiful flags - I love what they represent. Terri, this was such an informative and inspirational post. Your prayer flags are beautiful and very special. I followed all the wonderful links you provided and think this is a swap I must be a part of. Thank you! Hi Terri..absolutely spectacular...gorgeous..inspiring!! I love art and creations that are symbolic and meaningful and offer up such beautiful energies...totally uplifting and a feast for the eyes and heart...hugs..this is beautifully brilliant! 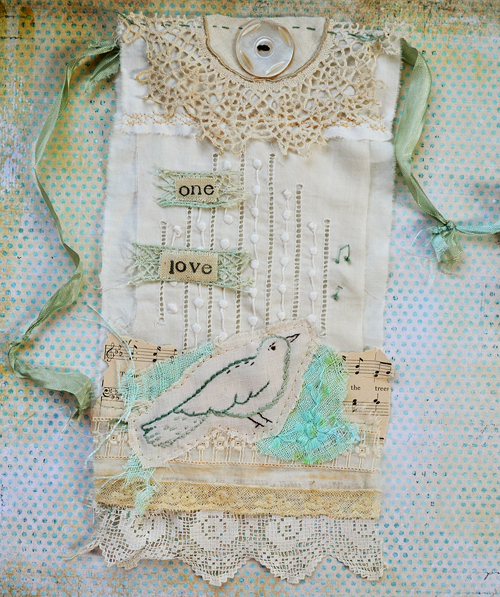 Terri, your prayer flag banner is just one of the loveliest pieces I have seen. From your little birdie to each embellishment...gorgeous! Terri, Thanks so much for sharing the Prayer flag links you found`truly inspiring! This is beautiful! And, what a lovely idea! I'm going to take a look at the blogs you suggested. 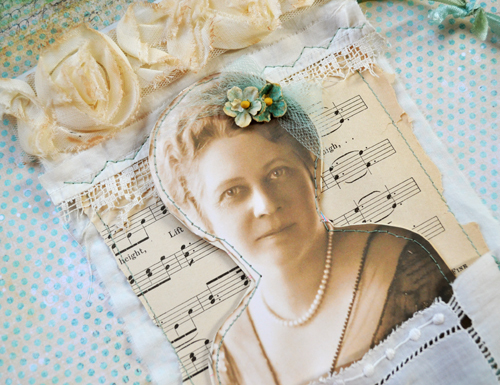 I love this art form, reusing the old to make new! I've never seen a prayer banner before. When I traveled to Tibet and Nepal back in the 1980's,I fell in love with the beautiful and colorful prayer flags that can be seen everywhere in those countries. I've been making them ever since. The prayer flags I see today on the internet are far different, and have a unique beauty of their own. I love your gentle flags, and the lovely messages they send. Your prayer flag is very special and beautiful! I am inspired to go over and take a look at the others on the blogs you mentioned. Who knows? Maybe I'll join in. Terri, these are so beautiful! I love seeing the Tibetan prayer flags on the high mountain photos & I even took a picture of some that were created for a new Asian Elephant exhibit at our zoo that I hope to paint someday. Of course, yours are so much more elaborate & much prettier to look at! TFS!! Beautiful prayer flags Terri! I just returned from the beach to find a pkg of prayer flags from a swap I was in and also -I joined Lenna's swap too-so glad you're a part of it!I love making these. Oh goodness, your banner is just beautiful! 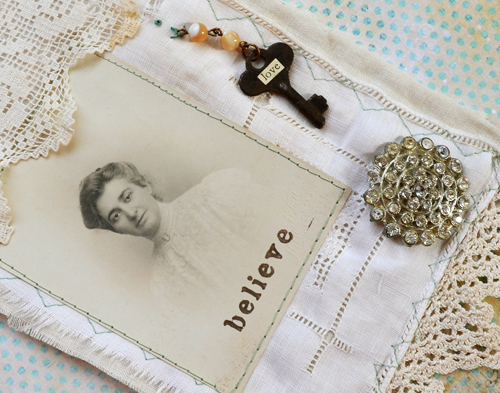 I adore making things with old linens, don't you? I've been working on a sweet little art journal this week using all old linens and lace. Lovely to see your prayer flags, Terri and what a pretty blog you've done. Now I know what to do with my antique hanky collection. 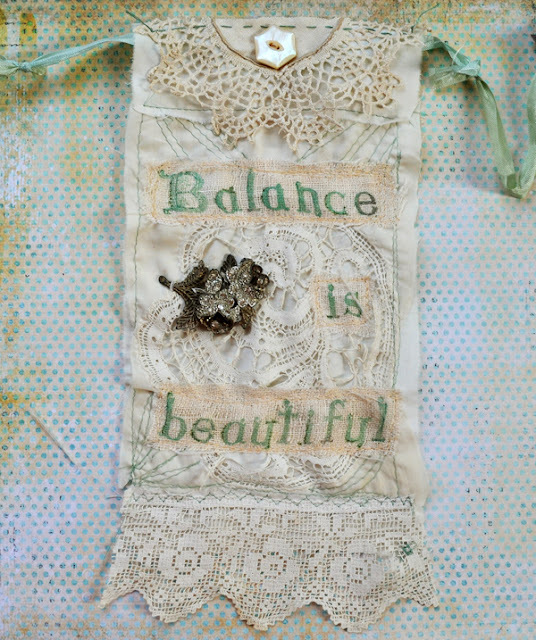 Terri, I just love this prayer flag/banner. What a lovely idea. Prayers are so powerful, and this is a creative way to give them a tangible presence. I think I'm going to start one of my own! Terri, your prayer banner is wonderfully beautiful - what a superb idea!! I love what you did here. It is very artsy, tasteful, and a brilliant idea to come up with something more than just an positive affirmation note. You gave me a good idea on what else to do with my little notes of being positive. Have a good day and more power! I LOVE this! I can't wait to make one of my own and maybe for a few special others! What a great idea. Thank you for sharing and putting all this positive, lovely energy out into the universe! Strattera is medication indicated in the treatment of ADHD patients of age ranges from children to adolescents to adults and is only available by prescription. [url=http://thisoldrv.com/]generic strattera[/url] The medication is most commonly offered in 10, 18, 25, 40, and 60 mg doses and it may take some time for the patient and the doctor to work together to find just the right dose as patients may be more or less sensitive to the medication. The medication is most commonly offered in 10, 18, 25, 40, and 60 mg doses and it may take some time for the patient and the doctor to work together to find just the right dose as patients may be more or less sensitive to the medication. Strattera requires gradual dosing as it will help to diminish the side effects that may occur if the full dosage was taken right away. Propecia as a hair loss solution While no definite cause has been definitively determined for this type of balding, evidence does strongly suggest that there is at least some genetic involvement and it is known that DHT is the hormone responsible for the actual hair loss. [url=http://www.hesitantrhino.com/]finasteride for sale[/url] Studies conducted on men who are suffering from male pattern baldness have shown that a significant number of men can achieve satisfactory results from the use of Propecia. Continued use of Propecia is required in order to keep any gains that have been made in terms of hair regrowth. Valium for sale. While some patients will experience some or all of these symptoms, others will not experience anything but a relief of their symptoms for which they were being treated. [url=http://www.radicalreplicas.com/]buy valium online without prescription[/url] Side effects usually include but are not limited to impaired motor function, decreased REM sleep, lack of coordination, impaired balance, nausea, depression, and dizziness. 5 times more potent than Librium, but it has become so much more because it is so versatile and is used to treat a growing number of illnesses. Doctors should work closely with those that they prescribe this medication to, to ensure that it continues to be a safe choice for each individual. buy atomoxetine Many patients and doctors prefer Strattera because it is not a controlled substance, but still provides 24 hour coverage. Order low cost Strattera medication online at discounted price. It will take six to eight weeks before it is fully effective, which means individuals need to be patient while they wait for the medication to be fully active. Patients should discuss any side effects with their doctor as they occur to determine Provigil continues to be the best medication for them. Provigil may also be prescribed for the treatment of symptoms associated with Multiple sclerosis. [url=http://www.courtarrestrecords.com/]purchase modafinil[/url] Doctors may also prescribe Provigil for the treatment of spastic cerebral palsy, ParkinsonпїЅs disease, opiod induced sleepiness, myotonic dystrophy, chronic fatigue syndrome, as well as fibromyalgia. Doctors may also prescribe Provigil for the treatment of spastic cerebral palsy, ParkinsonпїЅs disease, opiod induced sleepiness, myotonic dystrophy, chronic fatigue syndrome, as well as fibromyalgia. While it is often used to treat bipolar, studies have not proven that it is particularly useful in doing so, though many patients and doctors report being successful in treating the condition with the medication. http://www.kentwoodsoccer.com/ - topiramate migraine Topamax price. Topamax price. Topamax can also be used in an off label capacity for the treatment of alcoholism as well obesity. Imitrex can as be administered as a subcutaneous injection (An injection under the skin). http://www.bestoceangolf.com/ - discount imitrex Imitrex is packaged with instructions on how to take the drug and a list of conditions/illnesses ruling out the use of the medicine. For oral use, doctors will prescribe Imitrex in tablet form, but Imitrex can also be taken nasally as a spray. Long term patients may experience weight gain, CushingпїЅs syndrome, osteoporosis, glaucoma, cataracts, diabetes, and depression. cheap prednisone online Low cost Prednisone medication at very competitive price. It can be used to treat many different conditions such as asthma, COPD, CrohnпїЅs disease, rheumatic disorders, allergies, nephritic syndrome, thyroiditis, tuberculosis, MS, hypercalcemia, and ulcerative disorders. -Pounding Heartbeats. It's designed to be used as a appetite suppressant to help people trying to lose a significant amount of weight (used along with the common diet and exercise) for people with risk factors like a high blood pressure, diabetes or high cholesterol. [url=http://www.apromiseconference.com/]phentermine 37.5[/url] If you'd rather, you can take 15-37. Examples of MAO inhibitors include phenelzine (Nardil), selegiline (Eldepryl), furazolidone (Furoxone) or tranylcypromine (Parnate). When we finally go through the concept of your message appreciate, not just in relation to its a romantic connection with another, nevertheless being a sense which is engendered in case you have miltchmonkey an improved partnership with yourself very * or even just as a a sense of better unity spouse and children or simply humankind - then it gets a lot more extra ordinary that every one any person is looking for in your everyday living is actually really like. A proxy is a common phrase that is now utilized by several web end users. In English, proxy refers to a man or woman, who is authorized to act for some other particular person. In simple words, the motion essential to be accomplished by 1 individual can be carried out by yet another individual with no revealing his identification. The which means of proxy varies with the context. Proxy and [url=http://scrapeboxfaq.com/scrapebox-proxies ]Squid [/url] are two phrases utilized by intermediate web consumers. A proxy refers to a web site, which can be used to blocked details. In other phrases, with out any boundaries, you can get access to any info in excess of the internet with the use of proxy web sites. These proxy internet sites are simply named as proxies. Proxy server is an intermediate server, which handles information sharing between a consumer and a server. Any info shared among the customer and the server must move proxy servers. Proxy websites are designed to fool proxy servers. Practically all places of work and educational institutions set up a proxy server, which acts as a firewall. World wide web relationship to various pcs in the creating is provided only through the proxy server. Every single piece of details, which passes through the proxy server, is logged. This way, the officers can manage the world wide web obtain of their subordinates or students. A firewall is mounted in a proxy server, which restricts accessibility to numerous internet sites. In most of the cases, numerous known enjoyment and adult websites are blocked by proxy servers. Proxies are created to get accessibility to any internet site of the user's decision with out obtaining caught by the proxy server. When you use a proxy web site, your id is concealed and the web site, which you want to accessibility, is also hidden. These proxy sites are permitted by proxy servers and you can get any info you desire. You can accessibility several blocked internet sites from your business office or school making use of proxy web sites. Proxy servers are used to manage web obtain in the office. Apart from blocking internet sites, proxy servers are employed to offer a risk-free and secure browsing setting. All data passing by way of proxy servers can be analyzed before they attain any terminal. This function is employed to block spyware and other viruses from influencing a user's computer as well. To enhance community safety and accessibility handle, proxy servers are employed. When the community connects a large amount of computers, use of proxy servers gets to be essential to have a centralized entry to the internet. A proxy hides your id and lets you surf the world wide web with no revealing your IP handle. Proxies are now utilized by a lot of users, who desire to conceal their identity and escape from invaders. Anonymous browsing is now achievable with the use of proxies. Proxies for social networking websites are now discovered all above the net because folks want to use social networking internet sites when they are at operate. While the subject of using proxy to overrule accessibility management is a controversial level, you can use these proxies as long as your proxy server identifies and blocks proxies. Hi, I do think this is a great web site. I stumbledupon it ;) I am going to come back once again since I saved as a favorite it. augment or even I success you get admission to constantly fast. Hey very cool web site!! Guy .. Beautiful .. Amazing .
. I'll bookmark your website and take the feeds also? I'm glad to search out numerous helpful information here within the post, we'd like work out more techniques on this regard, thank you for sharing. . . . . .
issues and I to find it very troublesome to tell the reality nevertheless I will surely come back again. 1, [url=http://www.lunestabenefits.net/] Order Eszopiclone [/url] - Buy Lunesta - buy generic lunesta http://www.lunestabenefits.net/. 5, [url=http://www.cheapzoloftrx.net/] Zoloft For Sale[/url] - Cheap Sertraline - buy zoloft http://www.cheapzoloftrx.net/ . 5, [url=http://www.cheapzoloftrx.net/] Sertraline Price [/url] - Sertraline Price - sertraline online http://www.cheapzoloftrx.net/ . 5, [url=http://www.nexiumpricewatch.net/]Nexium For Sale [/url] - Nexium Online - nexium online no prescription http://www.nexiumpricewatch.net/ . 11, Order Carisoprodol - Order Soma - buy soma online no prescription http://mediati.org/ . 14, [url=http://www.celebrexonlinerx.com/]Celebrex - Purchase Online[/url] - Celebrex - Purchase Online - generic celebrex cost http://www.celebrexonlinerx.com/ . 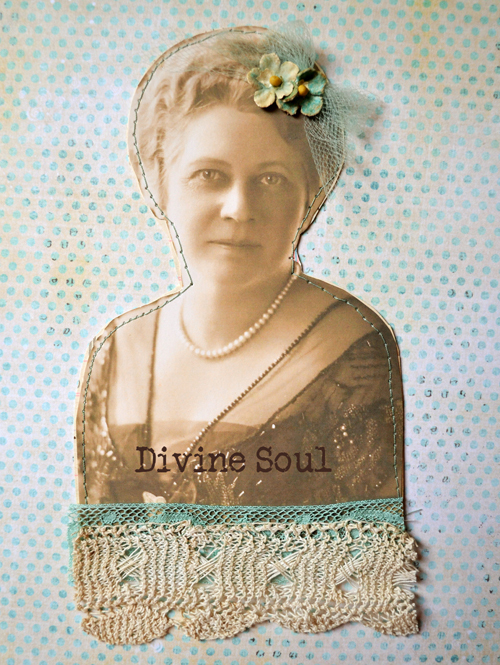 I'm really drawn to your use of aqua with the creamy vintage textiles. Aqua is becoming my New Favorite Color, even though I can't bear to think of cobalt and garnet not being my favorites, too. I guess I have Multiples!